Paws Unite People, INC hasn't added a story. Niko is an 11 month old pitbull that stepped in front of his 10 year old human brother when a reckless driver drove around a stopped car because they were late for work. The driver almost hit the child. Niko needs extensive surgery and ICU care. He has fluid in his lungs that is being treated before we can do surgery so he needs to be medically boarded and watched. He had to have his pelvis repaired and broken bones set. We have an estimate between 7000 and 8000 dollars, we will get 20% off the bill, so we need to raise at 7000 to get surgery done. This hero pup needs us. We thank God the child is not injured, and want to help save his best friend. Paws Unite People, INC hasn't posted any updates yet. 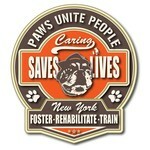 Paws Unite People, INC is managing the funds for this campaign.